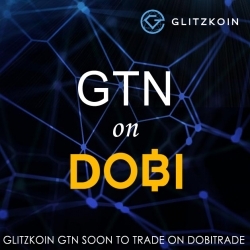 Trading on the Stellarport exchange since July 2018, the Glitzkoin GTN token will soon start trading on the DOBITRADE exchange. This move will provide additional exposure to the token. Los Angeles, CA, April 01, 2019 --(PR.com)-- Listed on the Stellarport exchange shortly after the completion of the Glitzkoin ICO in July 2019, the GTN token continues to gain the confidence of seasoned crypto traders. Announcing that negotiations have been successfully completed for the GTN listing on the DOBITRADE exchange, Glitzkoin CEO and diamond veteran Navneet Goenka had this to say: "...DOBITRADE has a significantly higher trade volume as compared to Stellarport. The buy sell process on the exchange, would also be more convenient and easier..."
The Glitzkoin management team has on various occasions, highlighted the importance of bridging the gap between technology and real world business. In the words of Navneet Goenka, "...one of the best ways to bring cryptos closer to the masses is to increase their usage..."
Listing the GTN token on multiple exchanges would improve exposure for the token. Glitzkoin recognizes two strategic stakeholders in the project – the diamond industry and the crypto community. Increased exposure for the GTN token, would generally have a positive impact on token demand and price. This is obviously something that crypto traders would appreciate. The GTN token has attracted interest from many nontechnical participants. These users would find it much easier to navigate the trading process on DOBITRADE. Trading on the Stellarport exchange can pose a few challenges for first time crypto traders. Glitzkoin leads the new genre of blockchain projects, that offer more than just a crypto to trade. Making a direct connection to the glittering diamond industry, the project is focused on improving productivity and sales in the multibillion dollar industry. Included in the project is a comprehensive diamond trading platform – DiaEx. Traders operating on the platform, would settle payments using the GTN token. This would generate a substantial number of nontechnical token buyers. The Glitzkoin Myticket.asia partnership, announced in January 2019, makes Glitzkoin an official payment partner on the online ticketing portal. Visitors to the Myticket.asia portal, will soon be able to pay for their purchases with the GTN token. This is another largely nontechnical group that would find it easier to operate on the DOBITRADE exchange. With the system integration process now at an advanced stage, the GTN token is scheduled to start trading on the DOBITRADE exchange in the month of April 2019. This would also the time when, the Myticket.asia arrangement and the DiaEx operation would commence. The Glitzkoin CEO talked about future exchange listings, "...we continue to seek, high trade volume exchanges to list the GTN token. We have always encouraged an increased use for cryptos and we will lead from the front...expect to see more GTN listings in 2019. Just to clarify, the Stellarport exchange listing will remain active even after, the DOBITRADE listing takes effect."